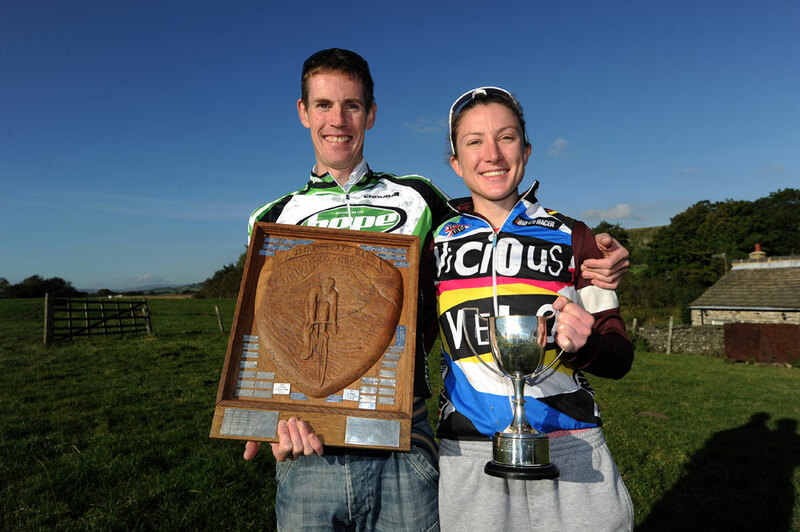 Course specialist Rob Jebb (Team Hope Factory Racing) gave another peerless display to win the 51st Three Peaks Cyclo-Cross classic in North Yorkshire for the 10th time since 2000. The 38-year-old, from Kendal, survived a puncture approaching the top of the final climb of Pen-Y-Ghent as he covered the 38 miles in 3-05-14 for a winning margin of 7-25 over Keighley veteran Ian Taylor (Jedi Cycle Sport), who improved on his previous best finish of third in 2010. Third place went to Jebb’s team-mate Dave Collins, who came in a minute and a half behind Taylor. First woman was 30-year-old Delia Beddis (ViCiOUS Velo), who finished just 56 seconds outside the four-hour barrier as she beat closest rival Isla Rowntree (Islabikes) by almost seven minutes. A field approaching 600 riders set off from Helwith Bridge under blue skies and sunshine, in sharp contrast to last year’s mist and wet, but with a strong wind blowing over the tops of the three major ascents of Ingleborough, Whernside and Pen-Y-Ghent. Jebb hit the front on the opening climb and, once clear, was able to ride at his own tempo on a trouble-free ride before his late scare. * In the opening round of the Central Cyclo-Cross League at the Hillingdon circuit in London, Liam Stones (MG Maxifuel) drew first blood with a solo victory on Sunday. He set a high pace from the start and gained an early lead which he gradually extended to cross the line well clear of runner-up Michael Smith (Team Corley Cycles) while Darren Barclay (Arctic SRAM) was third. The previous day, the London League moved to the Redbridge circuit in Essex for round four, and Matt Holmes (Arctic Premier RT) took the win by inches from Matt Webber (London Phoenix). Holmes held off Webber to clinch his fourth consecutive win in the series, while Jack Finch (PM Racing) completed the podium in third, 1-14 back. Mansfield rider Jonathan Harper notched up his first win since 2005 when he crossed the line 13 seconds ahead of his nearest rival at the end of the fourth round of the Notts and Derby League at Heanor, Derbyshire. Harper hit the front on the first lap, thereby avoiding a crash which delayed many of his rivals, and he ploughed on to victory by 13 seconds from Gareth Whittall (Clay Cross RT). Teenager Scott Gurnett won the Primera Purbeck Two-Day Road Race in Dorset after finishing second in the final stage and clinching enough bonus sprints to take the overall victory. The 17-year-old, in his first season of racing, was 14th after Saturday’s opening stage, he attacked with five laps to go on stage two, and took enough intermediate sprints to leave him in prime position for the win. While Chris Spence (Felt Colbornes) won the final stage, Gurnett’s second place was enough to win the GC by three seconds from Spence. In Leicestershire, Kenilworth Wheelers’ Dion Black won the Webster Cycles/Leicester Forest CC Road Race at Lutterworth. Black was part of a ten-rider break which got clear with three laps to go, but fairly soon after Black went away again with Robert Watkinson (Doncaster Wheelers) and Simon Alexander (Bush Healthcare CRT). The finish was at the top of a climb, and Black went early and had the power to hold off his rivals, with Watkinson second and Alexander third.